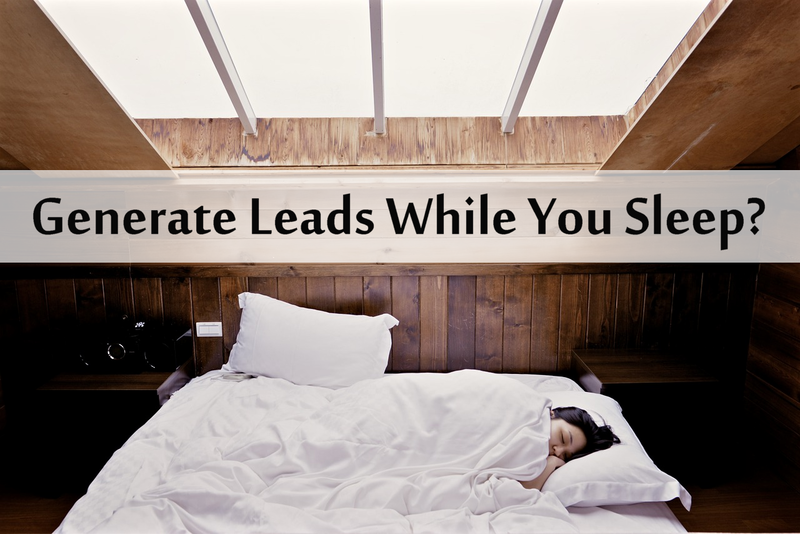 Have you ever wanted to generate real estate leads while you sleep? Or perhaps, get leads while you are sipping a tropical drink on a beach in Belize? Or maybe you are on a train to a conference in another city? What if we told you that was possible? There is a big millennial entrepreneurial craze about living a nomadic lifestyle and working from a laptop. That might not be feasible for real estate agents, but it can be possible to still have automation work for you while you spending time with your family or taking care of other tasks to improve your revenue from real estate or your other aspirations. Before we get into the list, we must first state that you must still be present in your business. This is after all, your business. http://blog.zurple.com/when-should-you-not-use-automation-in-real-estatea before human interaction is required. Your goal should be to have technology generate leads and then incubate them until they are ready to speak to a real person...not necessarily to press a button, and wait for the transactions to close themselves. When we say "Online Advertisements", we mean paid advertising such as google ads, facebook ads, etc. Social media posts are a whole other type of monster. Some of these platforms have a great amount of data that they can target your ideal client into giving you their information. Learning how to place ads online is another skill set, so you have the option to either learn it yourself...or have a service (such a Zurple) do it for you! A special bonus is that aside from networking (which we will discuss further), it is one of the more effective methods of generating immediate seller leads. Another great way to generate leads while you sleep is to put in the work, and network...building a strong network can do the work for you. Regardless if you are outgoing or an introvert, networking is a must-have skill in real estate. If you connect people and act as the connector for new relationships, business partnerships, etc...karma will pay you a visit, because the benefactors of those new relationships will feel compelled to recommend somebody to you when a friend or family member is looking to buy or sell a home. Networking also does not to be exclusively a "real life" skill, it can also be effective on social media. For example if you are active in Facebook Groups that are local to your area, even if it is not about real estate, genuinely getting to know people who have similar interests can go a long way. Email marketing is still effective, despite what that millennial marketer tries to tell you. You can write your own emails, or you can utilize a service that writes emails for you. Many real estate technology companies will have email campaigns in their back office. Yes, this includes Zurple too. The difference between our emails and other emails, is that we send emails that intelligently respond to your real estate leads' behaviors. The emails sent sound like they are coming directly from you...and you can literally sleep while you generate leads with Zurple. And at the end of the day...one thing everybody, especially real estate agents, can benefit from...is more sleep. Not sleeping enough? Click the button below to learn more about Zurple.